NAYPYIDAW— Fighting rampant corruption is the most important issue facing Burma today, said Upper House Speaker Khin Aung Myint in an exclusive interview with The Irrawaddy. The ex-minister for culture said that existing anti-corruption legislation is out-of date and proposed amendments had already been approved by the Lower House, and would be submitted to the Union Parliament during the next session. Six key ministries under the former military junta, all of which led by prominent members of the current administration, were accused of misusing billions of kyat in state funds in a government audit report released to members of Burma's Lower House of Parliament at the beginning of March. Khin Aung Myint revealed that he has approved the Public Accounts Committee of Parliament to investigate how ministries spend their budgets, and the legislature will urge the government to take action where needed. During an one-hour interview with The Irrawaddy founder Aung Zaw, the 67-year-old speaker also talked about the latest session of Parliament and related issues including military spending, an insider's viewpoint on the National Defense and Security Council and his attitude towards Burmese democracy leader Aung San Suu Kyi. He said that should the Nobel Peace Prize laureate join Parliament, it would be her decision whether to remain an MP or join a parliamentary committee. “She's a knowledgeable and educated person with both a good international as well as national image. If she's in the Parliament, our capacity will increase and new ideas will come out. But how she will participate is up to her,” said Khin Aung Myint on Friday after the end of the third session of Parliament. The speaker admitted that the legislature's third session, which began in January, was overwhelmed by the budget plan for the next fiscal year. He admitted that the budget allocation for military spending is still high at 16 percent, but claimed it was relatively low in comparison with other countries' spending and that both Houses of Parliament approved the allocation. And the former Major-General denied reports that the Parliament was always going to rubber-stamp military spending as the institution was heavily dominated by army officers and the military-dominated Union Solidarity and Development Party (USDP), by saying that the budget session would not have taken so long if the assembly really was so biased. As a member of the National Defense and Security Council—an 11-member government body with the power to declare states of emergency and appoint the commander-in-chief of defense services—the Upper House Speaker said that even although the council is approved by the Constitution, it cannot be involved in every issue of state affairs. Asked if there was a split between hard and softliners in the council, he answered “no division” with a laugh. When Suu Kyi visited the Parliament last week, Khin Aung Myint told her not to be worried about the small presence of opposition seats. “I told her we would all support anything that would be good for the country and people,” he said. When asked whether there had been any recent change in his attitude towards Suu Kyi, the former Major-General replied it would be wrong to think so. “If we regard General Aung San [the independence hero who founded the Burmese Army and was Suu Kyi's father] as our father, Daw Aung San Suu Kyi is our sister. I have never badmouthed her. I see her as my sister,” he added. Who needs enemies when you have brothers like KAM? The whole rotten lot lives and eats corruption from top to bottom. They are the ones who made it the only way of life in all of Burma's institutions - army, police, judiciary, every other department and then some. Completely absurd and utterly ludicrous (beyond a joke) that the very wellspring of corruption is set to fight corruption. Bloody barefaced cheek! Deeds are better than words. Time will prevail the truth whether the lady will be treated as sister or not. Khin Nyunt addressed her as sister and treated her badly. He met his nemesis and made time in notorious Insein prison. The whole world knows that Daw Aung San Suu Kyi is treated as virtual God everywhere in the country. I would like to read declaration of personal assets by all of the country's most important political leaders in different circles in the parliamentary system during the first round of sessions held after April 1 by-election. This includes declaration of Daw Aung San Suu Kyi being the opposition leader as an example, imagining the existing plan of both sides for the by-election goes well; to be followed by the president and speakers of both upper and lower houses, and so on. Once after the roof is repaired, it will become much easier for all to mend the systems under the same roof. We can read the body language of Khin Aung Myint. His hands, his head and his face are telling us that he is not telling/answering from his heart but from his lips. Oh! Is there corruption in Burma? So, is corruption the biggest problem in Burma? If it is not for the Upper House Speaker, the whole world would not know that there is corruption in Burma and it is the biggest problem in the country! What a surprise! What a surprise! Corruption is the biggest problem eh? So the illegal rigging of the implementation of the constitution is not corruption? The rigging of the election and rules so that Daw Suu could not take part is not corruption? If they really believed what they said they would all step down and run a free and fair election. For all seats right now. That would be the best way to end the corruption. Lets not mention the clause in the constitution which makes is impossible to prosecute the former govt. leaders for their crimes. The constitution is corrupt! The parliament is corrupt! You guys are "the corruption" resign and let real elected people lead. For the good of the country. What this crap is "Upper House"? And what is this "Speaker" crap? Faux American to fool the "stupid"s, willing opportunists and the sycophants.! What is this shameless idiot talking about"sister"? Look mate, if you guys are serious, start by giving back the loot of your papa Than Shwe and Kyaing Kyaing's theft and robbery. They are heading to Awizi anyway. Corruption. It is YOU mate, you and your mates embody corruption. spoiled. Therefore it will take time to rid off the habitual acustom. Society is looking illgotten wealth and power abuse wealth to make way for nation properties, the day will come soon for these type of peoples has to suffered during their life time not after death. Good to hear that.Anyway to build country must be together. It is great to learn that our leaders have the vision in rebuilding the country. Looks like most of the current leaders have good heart as well as vision. Good cooperation with Aunty Su will surely makes Myanmar to rise up to gain glory in near future. 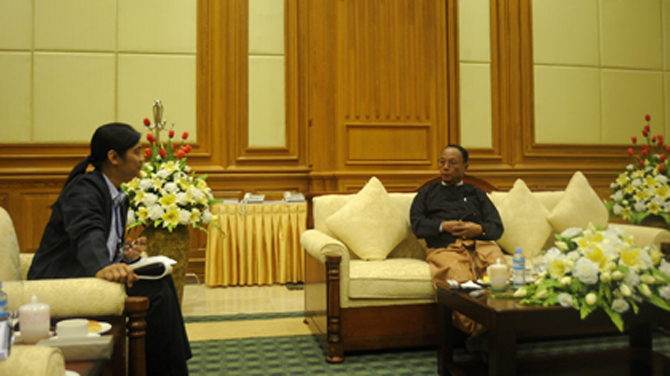 It is good Irrawaddy interviewed with upper house speaker who said Aung San Suu Kyi is his sister. It is a fact that General Aung San is founder of Burma army. In that case why Suu Kyi's party is treated like an enemy party? Let us keep our high spirit and good morale so that the coun try will develop as soon. A job well done by the audit team. We hope it will maintain its independency and integrity. The acknowledgement of the Speaker is also a healthy sign. Only when the disease is acknowledged, can remedies be found. Fighting corruption is an uphill battle but with the perserverance and integrity of the law enforcement institutions and the public, it can still be won. -RECOGNISING existence, magnitude and impact of corruption. Glad to hear form the speaker recognising it. Traditionally we only hear DENIAL for decades. -PREVENTIVE measures such as modules in schools and universities, inductions for government and private sector employees, in state media and billboards. “Anti-corruption Institute” may be suitable to give training. -LEGISLATION to customised market economy and changing political landscape, emphasis on prevention rather than punishment. If existing corruption cases are to be prosecuted, tens of years may be necessary to for trials, judgements and appeals. The country cannot afford such backlogs. -ENFORCEMENT should be quick and effective, otherwise legislation is meaningless. Burma should be cleaner in 2020!!! The generals always said so. The military regime departed from Aung San's way. These generals were the ones who tried to kill her at Depeyin. Pension for former SPDC members must also be regulated by Hluttaw. Shwe Mann and Khin Aung Myint need to tackle this issue. If corruption exists among the top persons, how can they stop corruption among ordinary citizens. Than Shwe needs to keep his mouth shut and let the hluttaw do its jobs. If anyone called me "my sister" I will watch my back!